Q: According to reports, the US Department of State announced on September 20 that it would impose sanctions on the Equipment Development Department (EDD) of the Central Military Commission and its director for violating the Countering America's Adversaries Through Sanctions Act (CAATSA). What's your comment? A: The Chinese expresses strong indignation at this above-mentioned unreasonable action by the US and has lodged solemn representations. The relevant US action has seriously violated the basic norms governing international relations and seriously damaged the relations between the two countries and the two militaries. We strongly urge the US side to immediately correct their mistake and withdraw their so-called sanctions, otherwise the US will have to bear the consequences. Q: The US State Department also said that it will continue to pursue sanctions and urge countries to end relations with Russian defense and intelligence sectors. I wonder if China will still continue to cooperate with Russia in the relevant area? A: China and Russia are comprehensive strategic partners of coordination. Our two sides maintain normal exchanges and cooperation in defense and other areas with the principle of equality, mutual trust and mutual benefit. The relevant cooperation aims to safeguard the legitimate rights and interests of our two countries and uphold regional peace and stability. It does not violate international law or target any third party. We will join hands with Russia to continue to implement the important consensus reached by the leaders of our two countries and elevate our strategic coordination to a higher level. Q: Should we presume that the defense cooperation between China and Russia would continue as it is without any disruptions, despite the US sanctions? A: I think the response I have given just now is clear-cut enough. Q: Do you have any details on the visit of the Vatican delegation? When are they coming? Who will they meet? A: As to this question, I have responded to it many times. I have no information to offer to you at this point. China and the Vatican maintain effective contact and communication. Q: According to the report of the Vietnam News Agency on September 21, Vietnamese President Tran Dai Quangpassed away today at age 61. What's your comment? A: Comrade Tran Dai Quang is an outstanding Party and state leader of Vietnam, who has made important contributions to Vietnam's cause of national development and reform and opening up as well as the deepening of China-Vietnam comprehensive strategic cooperative partnership. We express deep grief and condolence to his passing. 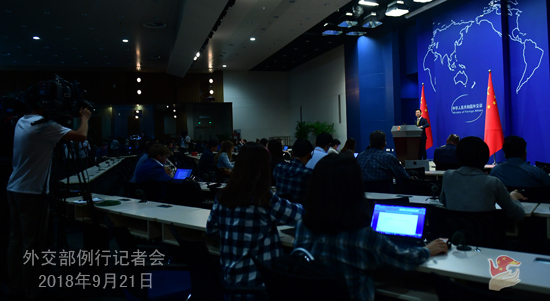 Q: The US defense department published its first cybersecurity strategy report on September 18, saying it will focus on states that can put strategic "threats" to the US prosperity, including China and Russia. What is your comment? A: The Chinese side has been a staunch defender of cyber security and has always firmly opposed and combated any form of cyber attacks and theft.The Chinese side calls on the United States to abandon the cold-war and zero-sum mentality and jointly address cyber security threats through dialogue and cooperation with China and Russia on the basis of mutual respect, equality and mutual benefit. Q: Has China decided to accept the US invitation for another round of trade talks? If so, when will it take place and who will lead the Chinese delegation? A: I already responded to this question several times recently. The spokesman for the Ministry of Commerce also made clear China's stance at a regular press conference yesterday. 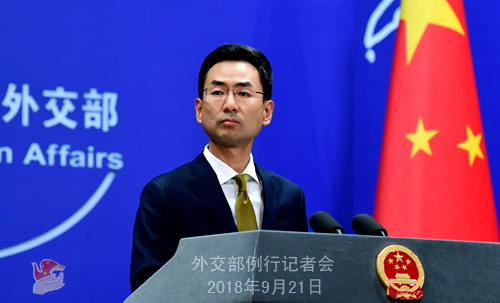 We have kept stressing that dialogue and consultation on the basis of equality, good faith and mutual respect make the only viable way to solve the China-US trade disputes. However, everything the US does has not given any impression of sincerity and goodwill. We hope that the US side will take measures to correct its mistakes. Q: State Councilor and Foreign Minister Yi Wang has already arrived in the Dominican Republic. Do you have any details on his visit? A: I haven't got the latest updates yet. According to what I had at hand before State Councilor and Foreign Minister Wang Yi left for the visit, he will meet with leaders of the Dominican Republic, hold talks with Foreign Minister Miguel Vargas Maldonado, and inaugurate the Chinese Embassy in the Dominican Republic. The updates on this visit will come out soon, please stay tuned to it. Q: The 12th World Economic Forum's Annual Meeting of the New Champions was concluded in Tianjin yesterday. Premier Li Keqiang attended the forum and delivered a special address. What message did Premier Li Keqiang send out at this forum? Firstly, China firmly upholds economic globalization. The Chinese side always believes that the rules-based multilateral trading system is the bedrock of economic globalization and free trade and that its authority and efficacy should be respected and protected. Taking a unilateralist approach will not solve any problems. The attendees echoed what he said by stating their support for multilateralism and free trade. Secondly, the Chinese economy maintains a sound momentum of steady progress. Premier Li Keqiang pointed out that the Chinese economy has stayed on the track of steady progress, with growing new drivers and sound fundamentals. The express train of China's economy will not lose speed but stay on a steady course. The representatives are also optimistic about the prospects of China's economy and believe that Premier Li Keqiang's speech will help the world get a better understanding of China's policies on development, reform and innovation. Thirdly, China will press ahead with reform and opening up. This year marks the 40th anniversary of reform and opening up. Since the beginning of this year, we have introduced a host of major steps to deepen reform, expand opening up and advance innovation. Going forward, China will work even harder to advance reform and opening up, restructure and stimulate innovation. China will further widen market access and continue to lower its overall tariff level so as to create a market environment in which companies of all ownerships, be they Chinese or foreign-owned, are treated as equals and compete on a level playing field. China will introduce a more rigorous system for intellectual property rights protection to make infringers pay unaffordable price. The representatives all expressed their willingness to continue to take an active part in China's reform and opening up and share the opportunities presented by China's reform and development in a bid to achieve mutual benefit and win-win outcomes with China. At last, I would like to stress that like Premier Li Keqiang pointed out, China's economic growth now accounts for about 30 percent of the world's total. The Chinese market is simply too big for any far-sighted business leaders to ignore. China is willing to work with all parties to ensure the new industrial revolution will promote the sustainable and inclusive growth of the world economy and make greater contribution to the recovery and steady growth of the world economy. According to this year's holiday arrangement during the Mid-autumn Day, there will be no regular press conference on September 24 (Monday). The press conference will be resumed on September 25 (Tuesday). During the recess, the Spokesperson's Office of the Foreign Ministry will take your questions via telephone and fax. Happy Mid-autumn Festival!